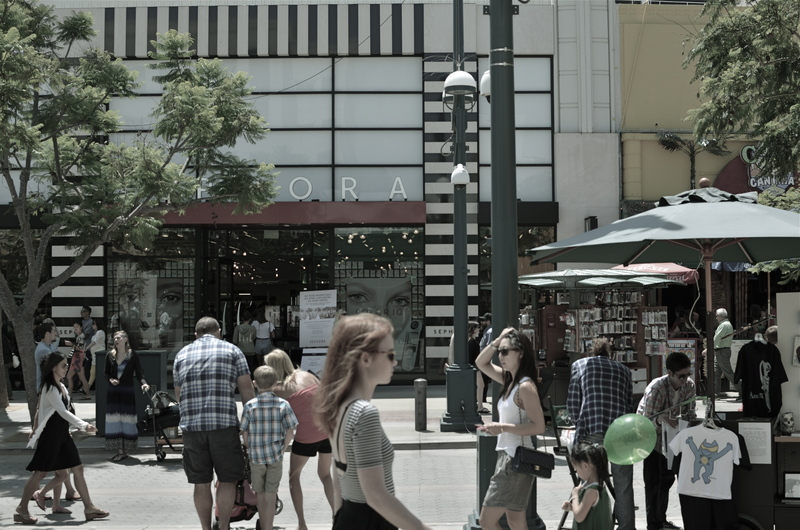 Third Street Promenade, Santa Monica, 2013. SOMETIMES THROWING EVERYTHING INTO THE POT MAKES FOR BETTER STEW. Yeah, of course a simple bowl of tomato soup can be elegant, understated. But so can pitching every stray ingredient into the mix and hoping the carrots play nice with the asparagus. Matter of taste depending on one’s mood. 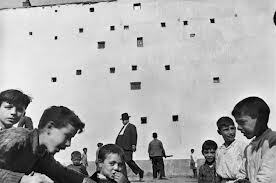 Henri Cartier-Bresson placed his camera at the intersection of “now” and “next”. So it goes with street photography. Some insist that isolating a single story, a singular face, a tightly framed little drama is the way to go. And that is certainly true much of the time. But so can casting a wide net, framing a grand, interactive ballet of conflicting lives and destinations. It’s like the concentrated, two-man drama of Waiting For Godot versus the teeming crowd scenes of The Ten Commandments. Both vibes come from the street. Just depends on what story we’re telling today. From the work of Henri Cartier-Bresson, the great street photog of the mid-20th century, I learned to love the seeming randomness of crowds and their competing destinies. HCB was a genius at showing that something wonderful was about to happen, and I love to see him capturing the moment before there even is a moment. His still images fairly beg to be set into motion: you are dying to see how this all comes out. If HCB is new to your eye, I beg you, seek him out. His work is a revelation, a quiet classroom of seeing sense. I have posted both quiet stories and big loud parades to these pages. Both have their appeal, and both demand a discipline and a selective eye, which means I have a few light years’ worth of learning before me in both areas. That’s the great thing about art. You can’t get done. You can be on the way, but you will not get there. Not if you’re honest with yourself. For the viewer, myself included, you have to go beyond “snap looking” which is the audience’s equivalent of “snapshooting”. Some images require that you linger, just as some wines are to be sipped instead of guzzled. Slowing down when viewing a frame is the best tribute to whatever pauses the photographer took in creating it in the first place. This picture business is truly a shared project between creator and user. Gosh, I feel all brotherly and warm-hearted today. Sort of an urge to be part of the crowd. This entry was posted on September 15, 2013 by Michael Perkins. It was filed under Los Angeles, Patterns, Post-processing, Snapshot, Street Photography, Viewpoint and was tagged with Art, Henri Cartier-Bresson, Street Photography.